I’ve been away for most of this weekend so have only now had a chance to write about Saturday’s final between Naomi Osaka and Petra Kvitova which was yet another absorbing match at this year’s Australian Open. In my opinion, it has been a terrific Slam. The week began with a surprising lack of chaos. It was rather refreshing as it meant the draw held up for the most part and produced some blockbuster match-ups for the later rounds which delivered some memorable matches. The tournament had a bit of everything as there were still some seismic upsets during the middle of the tournament and unexpected players breaking new ground at a Slam. Maintaining the recent trend, 23 of the last 25 Slams have now produced a first time Slam semi-finalist. Back to Saturday’s final where it was Naomi Osaka who made it back-to-back Slam titles with a 7-6(2) 5-7 6-4 victory over Petra Kvitova in two hours and 27 minutes. It was a good final with flashes of stunning quality, clutch play and a fair share of twists and turns. The first set, which was decided on the tiebreak, featured no breaks of serve. Both players had their opportunities to seal the elusive break, notably Kvitova, who missed five break points throughout the set including a 0-40 opening. Kvitova had some chances on Osaka second serves but was unable to execute. Kvitova then saved set points to hold on for the tiebreak with some gutsy one-two punches. While opportunities were missed, both players were clutch in defending their serves. In the tiebreak, Kvitova surprisingly backed off as Osaka, who hit four clean winners, claimed the opener. Kvitova managed to score the first break of the match early on in the second set. However, she was unable to consolidate it with a few missed chances at 2-0. Like a London buses… after 13 consecutive service holds, the pair traded breaks of serve. This proved to be a crucial game as Osaka roared back into contention, winning four straight games. I thought Kvitova began to look a little fatigued as she repeatedly produced errors. The standard of the second set didn’t meet the lofty heights of the first. Osaka though was the more solid player and repeatedly managed to claw her way out of games when Kvitova seemed to have the upper hand. Osaka chalked up three championship points on Kvitova’s serve, leading 5-3 in the second set. Kvitova managed to save them all with impressive resolve, crucially finding a first serve on all three. Osaka even racquet clapped Kvitova on one of the points. I wonder if the Japanese player relaxed for a moment. From there on in the second set, Osaka notably tightened and lost her way. The Japanese player was unable to serve out the set and was then broken to love on a double fault as Kvitova pojded her way into a third set. Osaka ended a run of five straight games to Kvitova to level up at one game all in the decider. It was an important game and Osaka settled down from there on. Osaka said in her press conference that she had to turn off her feelings. I’m astonished that she was successfully able to do this in such a high-pressure environment and it really is a mark of her champion-like qualities. Osaka’s forehand was increasingly decisive in the decider, more so than Kvitova, and she scored what proved to be the crucial break of the third set in the next game. 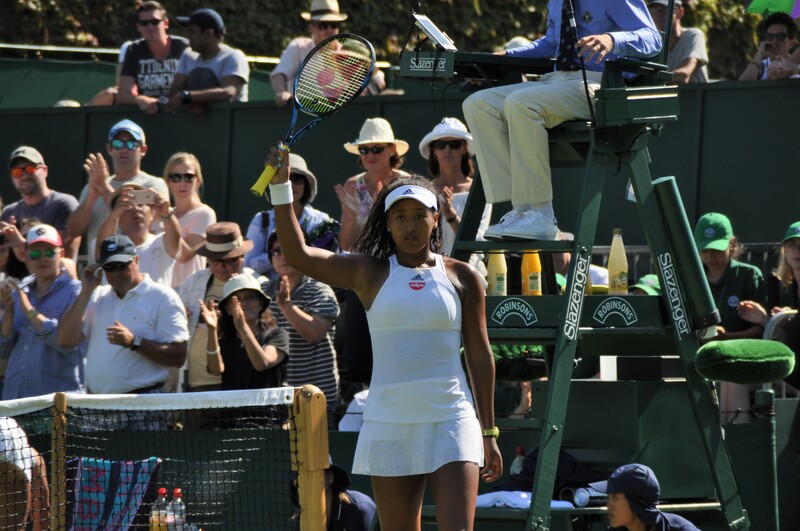 Osaka was continually tested in the third set as she faced a couple of similar situations to the second set. This time around, she was mentally defiant and passed each challenge with flying colours. Osaka faced a break point at *3-2 *30-40. While noticeably rushing, Osaka still conjured up two first serves, the latter an ace, and then won the game with a lethal forehand winner. Osaka carved out a 0-40 opening in Kvitova’s next service game, leading 4-2. Once again, Kvitova landed first serves on the break points and played an absolute blinder to hold. This time, Osaka retaliated with a love service hold of her own. Kvitova forced Osaka to serve out the title again at *5-4 and she did so with aplomb, to 15. Osaka ascends to world number one which is staggering considering she was ranked at number 72 this time last year. Her resilience and ability to reset in the third set after missing championship points was pretty amazing. I don’t think there are many players on tour who would have been able to put that disappointment behind them to come back like that. Naomi is special. My personal feelings of who I wanted to win the match were like a seesaw. I went in as Team Petra. When Naomi failed to serve out the match, I was then torn because I would have felt terrible for Naomi to have lost from championship points up. When Naomi rediscovered her form in the third set, I was back on team Petra. I was constantly rooting for the underdog 🤣. I’m sad for Petra but it was still a great tournament and her first Slam final away from Wimbledon. I adore her fighting spirit. I hope this result will positively impact on her mindset at future Slams. I hope she can have another deep run at Wimbledon in the future. I just about held it together during her speech! I’m glad Naomi managed to get through hers – you could see how nervous she was. All in all, a very enjoyable Australian Open. Normally I’m relieved at the end of the Australian swing as my sleep patterns are a mess but I actually feel a bit sad it’s over. After a shaky start where I woke up at 4am on the first day, it’s not been too bad! The Eurosport Player has been fantastic for catching up at normal hours and I feel like I’ve managed to watch back all the best matches of the tournament. The tennis now moves onto St.Petersburg and Hua Hin, the former with a sensational draw. I doubt I’ll be blogging much over the next few weeks although I hope to watch some tennis. I’m gearing up for the big move as I am moving to my new house in two weeks time. There will be a lot of packing, cleaning and clearing out all my clutter! January 27, 2019 in Australian Open, WTA. I couldn’t have asked for a better final or a winner I like more. Very excited for the future of women’s tennis with Osaka leading the way. Terrific final to start the year! Was rooting for Petra but happy for Naomi. Did anyone catch the men’s final? Novak Djokovic was otherworldy good! Lost one point on serve in the first set and ended up with 34 winners to just 9 unforced errors. He absolutely destroyed Rafa. Didn’t catch the men’s final, surprised how one-sided it was considering how Nadal had eased his way through the draw. Novak just gets in Rafa’s head and makes him feel like he can’t go for his shots. Even on clay, Djokovic really rattles him. I do also feel like Nadal hadn’t had much of a test up until the final, whereas Novak had a couple of tough rounds. It appeared to be an AO with good weather, except for the semi with Kvitova and Collins. I still do not understand why they don’t close the roof for the comfort of the fans and ballkids. There is no good reason to make the fans suffer in the very hot sun. Yes seemed a bit odd to close the roof midway through the match. Sounded like the fans were happy based on the big cheer when they announced they were closing the roof. I’m loving Donna Vekic right now! Really can’t decide who I want to see win more between her and Bertens… just as long as it’s as good a match as it has potential to be. Both looking good and both had quite similar seasons so far. Vekic played such a clean match today vs. Zvonareva! I think her attitude on court has been steadily improving. Great win in the end from Kiki in St Petersburg (and nice hug at the net between her and Donna too). It’s good to see her coming up trumps again in a tournament after a below-par (for her) start to the year in Australia where she was on the losing side of several three-setters. Donna’s really come on in her tennis recently. I’ve long thought she had a lot of potential that she somehow was never able to realise in practice; now it looks like she’s finally managing to. On another note, I’m sorry to see that the tournament in Connecticut is no more. It was a popular one with both players and tennis fans. Very intrigued that Caroline Garcia is returning to fed cup action. Alongside Mladenovic and Cornet no less. Let’s hope it kickstarts her abysmal season! I’m glad that Caroline is playing for France again; I think the team missed her last time. Also, well done Alize for beating Elise Mertens (not at all an easy opponent) yesterday. The Swiss team (featuring Belinda and Timea) did well against Italy too. In other news, a fantastic effort by Jo Konta, who was feeling way below par yesterday but still turned up and did her best; she literally had to be helped off the court after winning her match against Alex Krunic. Great win by Katie too. 2 out of 2 wins for Garcia at Fed Cup. Probably her best wins of the year so far, too! Pleasantly surprised, all things considered. It must have been fairly intimidating going back into a team where you’ve been subject to bullying and general nastiness. Nice to see Garcia back playing in Fed Cup. I guess they’ve cleared the air. I was surprised by the results as Garcia had struggled so far in 2019. Only caught glimpses of the GB ties this past week but great effort from Konta and Boulter. I hope we get a home tie in the next round! The day on which Serena Williams lost the match to Karolina Pliskova after holding three match points, the legendary American didn’t make any excuses for her collapse. She was quick to play down her ankle injury; she was cautious for not making any comments which defend her. Great Serena!! For you, there is nothing new in lifting that heavy trophy; you’ve already done that many times. But it’s sure you will go past the 24th milestone sooner or later although you don’t have to prove anything. Why on earth has Naomi sacked Sacha?! There’s no way she’d have won the past two Slams and gotten to #1 if not for him… i’m just absolutely dumbfounded! Would love to see someone like Muguruza or Garcia snap him up. To part ways or not to part ways?, that is the question. I asked myself the same thing as I watched Pliskova dismantle Muguruza a couple of weeks back in Australia. I thought to myself, why did Garbine part ways with Conchita Martinez only for her to be coaching Karolina. Of course she’s going to spill all Garbine’s secret weaknesses to Pliskova. But it is seemingly the norm now. To borrow the phrase ‘knowing the path is different from walking the path’. It’s mental I feel. Once these coaches come in and unlock that mental ‘block’ to reach the next level( ie. walk the path), it does change the players in a way and asks new questions of them. Adapting to that new relationship may be the issue. Trying to avoid any insinuations here, but Osaka’s game style hasn’t changed massively, but her mental approach has. To be honest, personality wise, she wasn’t exactly that open outgoing type. The success, the pressure, the eyes on you, who knows what goes through her mind these days. I hope it is for the better, there may be comfort in her old default self, but I like this new punchy Naomi. Fingers crossed it is progressive. Hmm, Garcia could be interesting, Davenport is still with Madison Keys else she could be a candidate, or …lol 🙂 ….could he find the tools to ‘wrestle’ a Coco Vanderweghe into some Grand Slam finals. Sabine Lisiciki, where is she ?! There is no end to the possibilities. Pliskova has always had Muguruza’s number. And she’s in better form. I doubt that match had little to do with any inside secrets. Lisicki played a few weeks ago. She played Muguruza funnily enough! I think at this point she’s just too battle scarred, too many injuries and illnesses for her to make a real go of things. Back on Osaka, I honestly can’t see this being good for her in the short term. I felt like she was the favourite for Dubai next week. Now I’m not so sure. Only just seen this but I agree, Naomi parting company with Sascha doesn’t seem to make any sense. Nor did I understand why Sabine parted with Christopher (Kas) as I think he was good for her game. I always thought Tom Wiktorowski was lucky that Aga stuck with him for so long even when her results were going into decline; that kind of loyalty between coach and player’s getting rare now. Domi Cibulkova’s still with coach Liptak (forget his first name), which is the best example of of coach-player loyalty I can think of (he’s been working with her since at least Miami 2014), but her results are at least OK at the moment. In other news, congratulations Angie Kerber on her 600th WTA match win yesterday; an amazing achievement in the game. I was shocked! It feels like something happened behind the scenes. I’m sure she will be asked about it next week in press, interesting to see how she handles the questions. I just don’t understand what could have happened that needed a complete parting? I’ve heard rumours that he wasn’t as active in her team early this year as he was last year, but since he was largely there for mental support and encouragement, that shouldn’t really be an issue. He absolutely gushes about her in the press! Well, Naomi has given us some answers and it is much like I thought. She says she wants to be happy, won’t sacrifice happiness for success. The energy she was getting from Sascha was too negative for her and she wants to be surrounded by positive people. Money, she says, had nothing to do with it. I kind of picked up on that during her asian tournament run last year after the US Open. Getting to the end she complained of fatigue amongst other things. Felt to me like too much baggage too soon. It’s also to do with her own personality. Still wish her good things. Now that she knows what it takes to get there, like Justine Henin once said, you need to find the solutions and take care of those solutions….That’s what the greats did. 🙂 Yep, simply put, you’ve got to maintain. Have to say I’m very impressed with Svitolina’s second serve this week. It’s always been attackable, she generally only hits it around 115-120kmph but she’s added a good 10kmph to that and some of them have been almost 140kmph! It’s made all the difference to her game, because she’s otherwise looked a bit low energy and rusty off the ground but come through fairly comfortable against opponents playing really well. I’ve been impressed with Svitolina so far this week in Doha. I was quite excited to watch Muchova for the first time yesterday. She’s such a classy player and looking forward to watching her progress this year. Yes I enjoy Muchova’s game. But then, Czech always seems to have the most interesting and refreshing young talents. I still believe in Marketa Vondrousova! Yes, Marketa’s not even 20 yet so she’s still got plenty of time to round ojut as a player (she’s pretty impressive already). I saw an interview with Petra recently in which she was asked how the Czechs do so well in women’s tennis, and from what she said it seems there’s no magic formula; it all comes down to how well supported the game is in the country in terms of facilities and the level of interest amongst the general public. There have been some great matches this week. Domi Cibulkova put up a good fight against Karolina Pliskova, but Karo prevailed in the end. Carla S-N’s through to the quarters after a good win against Kiki Mladenovic, who beat Naomi Osaka earlier in the tournament. She meets Elina next, who’s through after beating a decidedly subpar Garbine (is it time she got a new coach?) and playing very solidly throughout.. And lastly, I loved Beljnda’s reaction after beating Aryna Sabalenka yesterday; I found it impossible not to smile in sympathy! I’ve been following Dubai from afar this week. Bencic-Sabalenka sounded exciting so hoping to watch that one back tonight. I’m really pleased to see Kuzmova finally have her breakthrough win on tour. She’s been on my radar for a while. I only saw the highlights for Svitolina-Muguruza but Elina looked really good? I think Garbiñe is often dismissive on changeovers with Sumyk. I find it uncomfortable that she rarely says anything! I don’t know what to think with Muguruza this year. I think she has been a bit more solid so far this year but in her two matches vs. top 10 players, she was soundly beaten and she generally seems very tense and on edge on court. I’m interested to see how Svitolina gets on at Indian Wells and Miami. I feel like she is primed to win one of them this year, despite not having stand-out records at either tournament. Well it’s kind of strange that Svitolina hasn’t had a good run on an American hard court since New Haven in 2016! As annoyed as I was that she lost to Halep last week, it turned out to be a good thing. She wouldn’t have been as rested had she played the final and there are more points on offer in Dubai anyway! Just seen the highlights of the Bencic-Halep match, and I’ve been very impressed with the way Belinda’s playing at the moment, moving Simona around the court and exploiting her reluctance to come into the net. Nothing against Elina but I hope she makes the final. The thing is that Simona was CLEARLY tired. No way would Bencic have won the match had Simona just been a few % fresher. Bencic really needs to practice finishing off shots. She’s awesome from the baseline, but when she gets short balls she hits far too many into the net when they should be winners. Disappointed with how Elina played today. She played Bencic how she plays Halep and Wozniacki, going for central shots. She should have been aiming for the corners to expose Bencic’s movement. Belinda is too good at redirecting when she has her feet planted, you need to get her trying to hit on the run. It’s been a good fortnight for Swiss tennis. Roger Federer won his 100th title, Belinda Bencic is clearly back to playing her best tennis and captured the title in Dubai, and Viktorija Golubic has now won the 125k title in Indian Wells. Congratulations to all. And Golubic now in qualifying for the Premier Mandatory event!